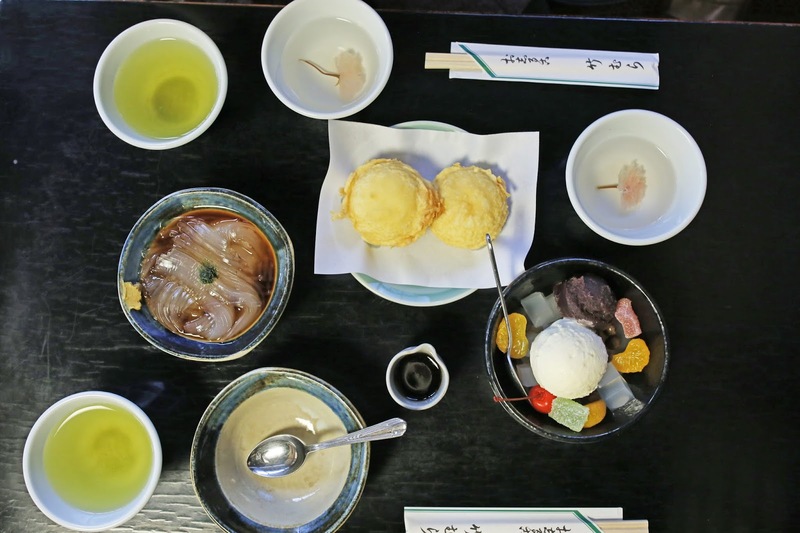 Takemura 竹むら is a traditional Japanese dessert shop located near the historical landmark, Old Manseibashi Station. The specialty of this sweet shop is "Manju-Age", which is a fried mochi dough with azuki red bean paste inside! I also highly recommend traditional Japanese sweets because they contain only vegan ingredients: tea, fruits, agar jelly, soy sauce, mochi, azuki red bean paste, pea, etc. 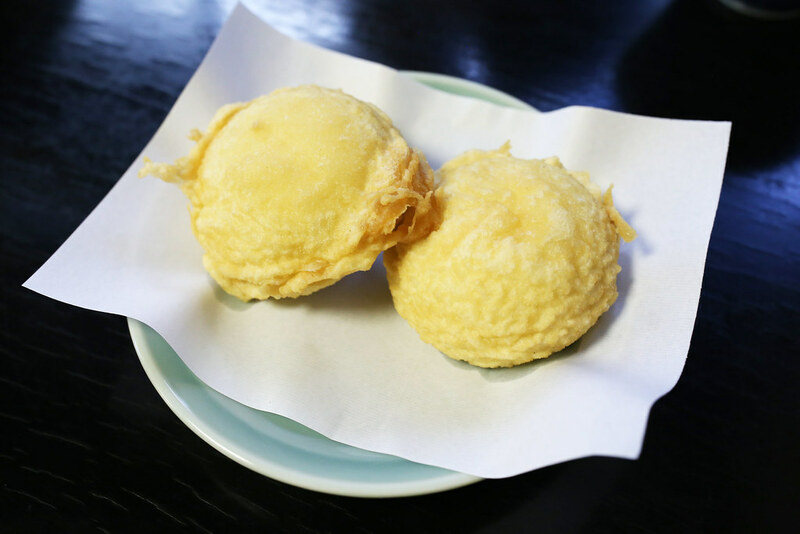 Found in 1930, Takemura 竹むら still serves the same traditional desserts for almost 90 years! Just across the bridge from Akihabara, the energetic town filled with electronics, anime, manga, and games, this neighborhood is very peaceful and quiet. It's only about 10 minutes walk from Akihabara, so this is definitely a sweet spot if you want to take a quick break from the busy district. 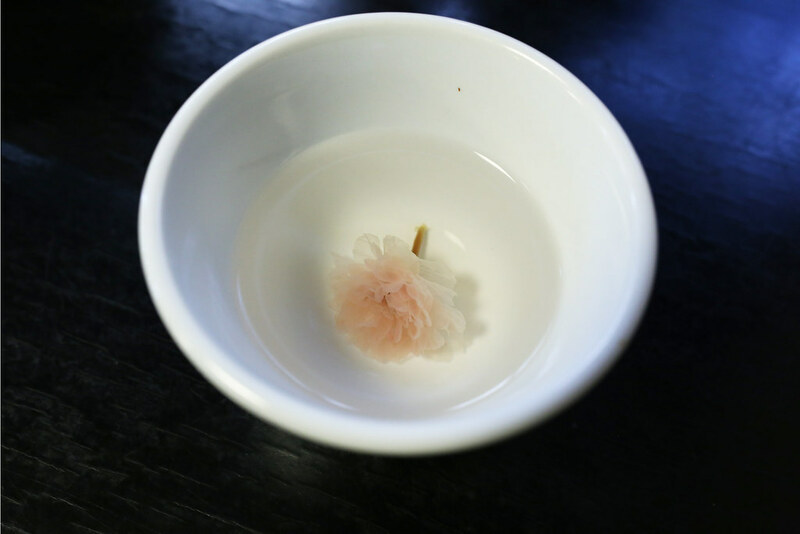 Once you are seated, you will be served a cup of green tea and Sakura tea, which you will see the beautiful pink cherry flower in your tea. :) It has a light savory flavor and subtle sakura aroma. The shop's specialty is their "Age-Manju." You can see almost all tables order at least one of them. 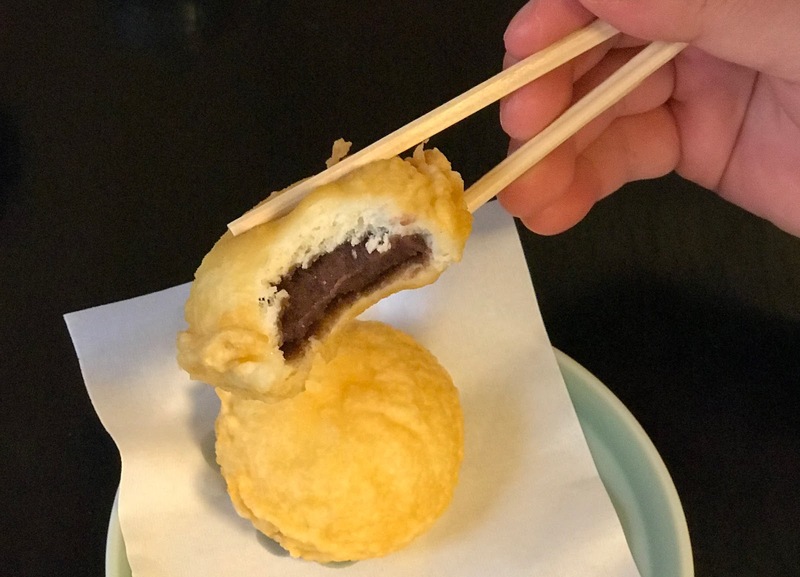 The fried dough is filled with azuki red bean paste and it's warm and delicious! The fried dough is a bit crispy outside and soft (like Chinese Mantou bun) inside. The bean paste is not too sweet, just right for me. 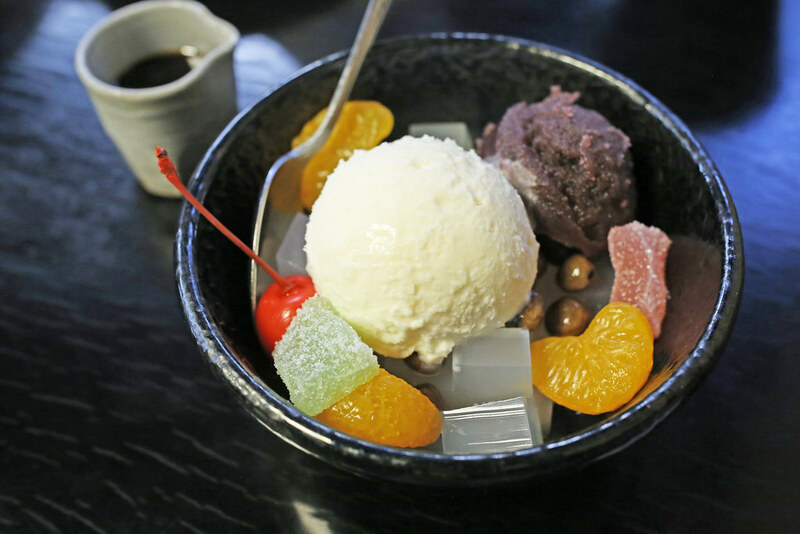 Cream Anmitsu is consisted of many sweet goodies in one bowl, which here we haves kanten agar jelly cubes, azuki red bean paste, boiled peas, gyuhi mochi (green and pink), cherry, slices of tangerine, and of course topped with a scoop of vanilla ice cream! Not only you can find them during summer, Cream Anmitsu can be enjoyed in winter too! 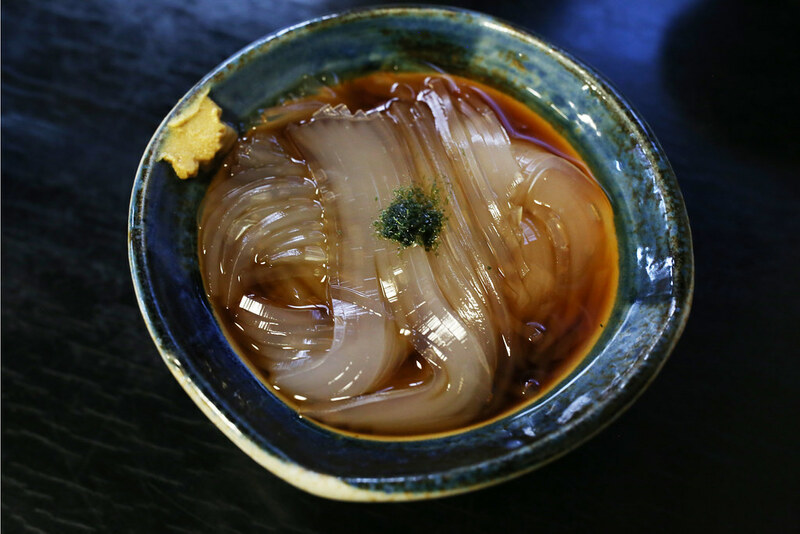 With a bit of Japanese mustard on the side and topped with sprinkled nori seaweed, this jelly noodle is served in cold, vinegar and soy sauce mixture. This is a popular summer dessert that can definitely cool you down from the hot sun outside. Remember to get their specialty: 揚げまんじゅう"Age-Manju"
These are really popular places in the city for private events for corporations like us. It can be hard to find the right venue for big events. The right size venues in NYC, that are flexible fits well. Thanks to you.